The Waverly Community House and the F. Lammot Belin Arts Scholarship Program are inextricably linked. 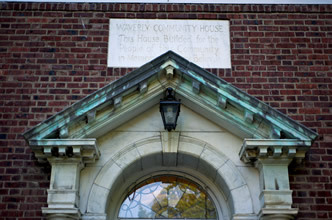 Winners are determined by the Board of Trustees of the Waverly Community House which was built to honor the memory of F. Lammot’s father, Henry Belin. Henry’s wife Margaretta and her children were prepared to create a memorial park in Waverly where the family for years spent its summers. Son Paul, however, suggested something quite different — a community house that could become a focal point for community camaraderie, a center that stimulated the interpersonal contact a suburb would eventually need: culture, education, athletics, relaxation and friendship. Margaretta asked Lt. George Lewis, a young pilot just home from World War II, to canvass such houses in New England. Upon his return he was commissioned to draw the dream, his first as a rising architect. And so The Waverly Community House, fondly called “the Comm,” came to be. 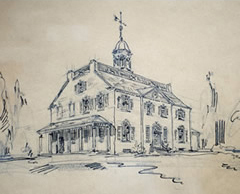 The cornerstone was laid on July 26, 1919 and on June 4, 1920, the building and a portion of the land were deeded to Abington Township for the benefit of “any and all residents of the Township.” By 1927 the success of the dream required additional space. 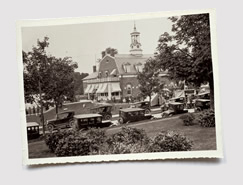 In 1955, the stage was enlarged and four bowling alleys were added with funds provided by F. Lammot Belin as a memorial to his wife, Frances Jermyn Belin. 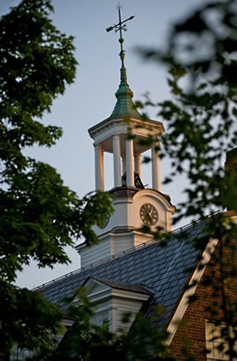 The funds left over from this project were set aside in 1960 by the Board of Trustees as an endowment for the benefit of the Community House and is supplemented since by memorial bequests. For more than 80 years, the Waverly Community House has been the social and cultural center of the local community. The Comm was incorporated as a not-for-profit in 1981. In 1990, with the help of a state grant and support from the community, the Robert S. Leathers Playground was constructed on the grounds. In 1996, a Memorial Garden was constructed and funded by a gift from Harry Belin as a memorial to his father, Captain Peter Belin. Throughout the decades it has changed and developed, yet one thing remains the same,this unique and beautiful place continues to serve the community, connect neighbors, and provide a haven for families and individuals. To learn more about the Waverly Community House, click here.